This beautifully illustrated storybook ushers children into a story of adventure, mystery, and wonder in which they discover life-changing truths about God, themselves, and the world around them. Truth is for kids, not just for adults! So The Ology gives kids of all ages a beginner’s theology book to help them understand who God is and how we, as his children, relate to him. Arranged within a traditional systematic theological framework, each truth in The Ology is also connected to the larger redemptive story of Scripture. The doctrine of God, for example, is presented in the larger framework of creation, where the attributes of God are more clearly on display. The Ology takes abstract theological concepts and makes them easier to understand with the use of creative examples, illustrations, and analogies. The goal is not to say everything that could be said about a theological topic, but rather to share the key thoughts behind a theological concept. The Ology is a starting point to learning theology and aims to create a hunger and desire in children to learn more as they grow older. Designed for six-year-olds through preteens, this flexible resource includes built-in adaptations for use with younger or older children, so that entire families can enjoy it together. Read The Ology to preschoolers, read it with grade-school kids, and let older kids discover the “hidden” truths by reading the corresponding Scripture passages for each section. However you read it, The Ology will give your children a gift that will last a lifetime—a solid foundation of life-changing biblical truth that will point them to the God who loves them and gave himself for them. - Designed for six-year-olds through preteens, with built-in adaptations for use with younger or older children, so that entire families can enjoy it together. 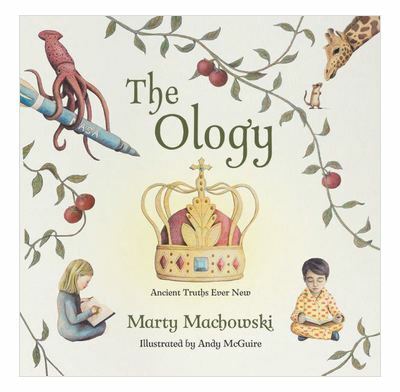 The Ology is a book of systematic theology written especially for six-year-olds through preteens. The author, who has six kids of his own, has intentionally created a vivid resource, full of analogies and word pictures that help kids grasp difficult theological concepts and understand how each truth is connected to the larger redemptive story of the Bible. Built-in adaptations and activities help parents with younger or older kids make the material accessible and engaging for the whole family.